Prenatal imaging technologies have seen incredible advancements in recent years, going far above and beyond the now antiquated black-and-white images of the ultrasounds of yesteryear, into full color, three-dimensional images of an unborn baby (see our previous story on GE’s amazing HDlive 3D ultrasound). Tecnologia Humana 3D takes these mind-blowing developments one step further by not only allowing parents to see their child in the womb, but actually enabling moms- and dads- to be to hold a model of their fetus in their hands. Sonogram data is fed to a 3D printer that recreates an exact replica of the tiny, growing body. This new technique could help doctors treat abnormalities or deformations, and allow blind patients to physically interact with their developing children. 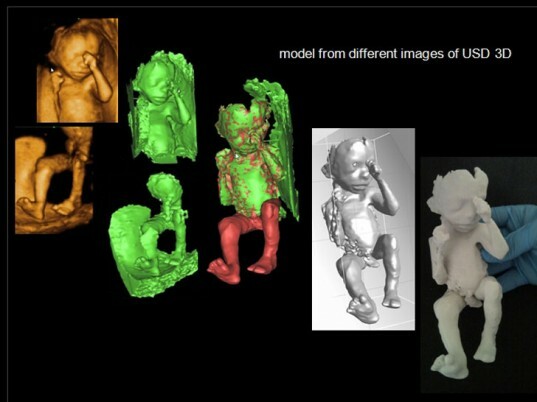 Developed by Jorge Roberto Lopes dos Santos with the Instituto Nacional de Tecnologia in Brazil, Tecnologia Humana 3D’s imaging systems have made it possible to fully scan a baby in the womb. In addition to identifying exterior features, the technology is even able to explore the inside of the body, looking at the internal organs and skeletal system. Dos Santos hopes to keep the cost of the technology low enough to be accessible for parents-to-be. A model of a life-sized fetus at 12 weeks costs about $200, and $300 for a model of a 24 week-old fetus. Now, instead of a grainy printed image inserted into an album, families will be able display a small figure of their baby in incredible detail. Don't expose your baby to high wave ultrasound frequency unless there is a medical reason. Prenatal imaging technologies have seen incredible advancements in recent years, going far above and beyond the now antiquated black-and-white images of the ultrasounds of yesteryear, into full color, three-dimensional images of an unborn baby (see our previous story on GE's amazing HDlive 3D ultrasound). Tecnologia Humana 3D takes these mind-blowing developments one step further by not only allowing parents to see their child in the womb, but actually enabling moms- and dads- to be to hold a model of their fetus in their hands. 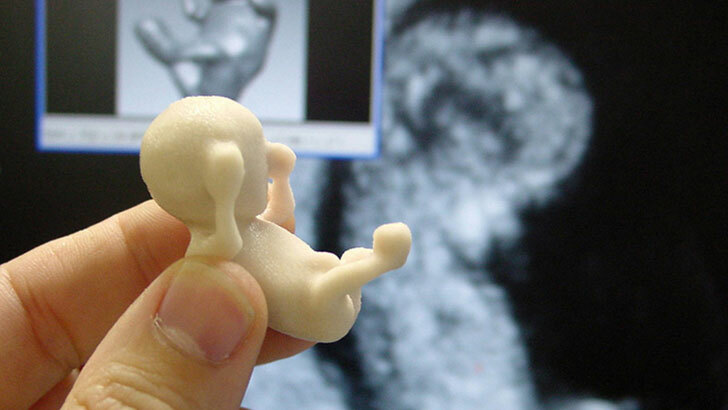 Sonogram data is fed to a 3D printer that recreates an exact replica of the tiny, growing body. This new technique could help doctors treat abnormalities or deformations, and allow blind patients to physically interact with their developing children.